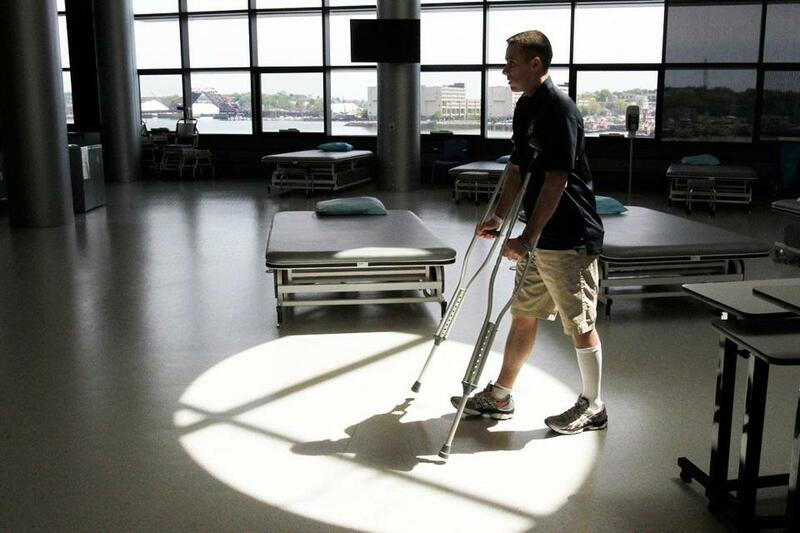 MBTA Transit Police Officer Richard Donohue stretched his legs at Spaulding Rehabilitation Hospital. Officer Richard “Dic” Donohue of the MBTA Transit Police remembers almost nothing of the night he was shot during chaotic gunfire on a normally quiet Watertown street, or of the murder of his close friend, MIT police Officer Sean Collier, hours before in Cambridge. 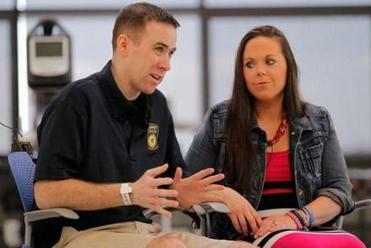 But on Sunday, about a month after he was seriously wounded, Donohue, looking relaxed, sat next to his wife, Kim, in the Spaulding Rehabilitation Hospital gym overlooking the harbor and the Boston skyline. Donohue, 33, iced his leg, his crutches nearby, as he spoke about the pain he suffers from nerve damage. In the early morning of April 19, Donohue was called to the scene of the shoot-out in Watertown, where more than 300 shots were exchanged between police and the bombing suspects, brothers Tamerlan and Dzhokhar Tsarnaev. He was struck in the right groin area by a bullet that severed his femoral artery and caused profuse bleeding. The bullet is still inside him. 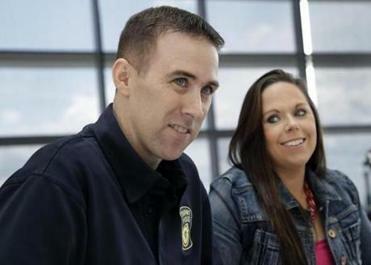 “I’m getting stronger and healthier by the day,” said Donohue, shown with his wife, Kim. Donohue was rushed to Mount Auburn Hospital, where he was operated on and monitored until he was moved to the Spaulding Rehabilitation Hospital in Charlestown on Thursday. Donohue said he cannot recall much from the night Collier was shot and the subsequent shoot-out. When he woke up in Mount Auburn Hospital, he did not understand why he was there. “I wasn’t shot,” Donohue responded when Kim and his brother told him what had happened. In disbelief, he turned to medical personnel and received the same answer: Yes, you were shot. Only later did he realize how serious his situation was. Family and friends kept him from watching television news to protect him from learning more about the bombings until he was ready. They also did not want him to find out from TV about the death of Collier, with whom he graduated from the police academy. During the interview Sunday, Donohue wore a “Collier Strong” bracelet around his wrist. “It was a lot of information for someone in that type of pain to process,” said Kim. Slowly, memories began to return. He remembered eating lunch in Cleveland Circle the day of the Boston Marathon. Later that night, Donohue was at Collier’s murder scene, despite the night being a blank to him. Collier is still very much on the Donohues’ minds. Kim said she felt him watching over them when her husband was wounded. The shoot-out is still under investigation, but the Globe has reported that multiple eyewitnesses said Donohue was hit by another officer. He was told the gun battle was “mayhem,” he said. But both suspects were stopped, he said, and that was what mattered most. Tamerlan Tsarnaev, 26, was killed in the shoot-out. His brother, Dzhokhar Tsarnaev, 19, was wounded and later arrested. He is being held at Federal Medical Center Devens. When asked if Dzhokhar Tsarnaev, who faces federal charges that could bring the death penalty, should be executed, Donohue declined to comment. The state and federal government can handle it however they see fit, he said. As for charges being brought, Donohue said he wants justice. Although Donohue continues to improve, it remains unclear when he will be headed home to Kim and their 7-month-old son, or when he will return to work.